Below is the feedback from the students who attended SIGGRAPH 2010 in Los Angeles through the Spend a Week at SIGGRAPH program. The ACM SIGGRAPH Computer Graphics Pioneers and the National Science Foundation (NSF) sponsored the students. We’ve removed the students’ and mentors’ names, and reformatted the text for consistency. All content, grammar and spelling are directly from each student. As the two days passed by I went to many areas of the convention learning a lot about what I am interested in. I never expected to see that much creativity and devotion to the graphic arts. I saw many different areas of graphic arts itself that I never knew about, especially in movies that have recently come out. My two favorite talks to go to that I learned a lot from to were, The last Air Bender-Harnessing the Elements: Earth, Water, Fire, and Air and How to Train your Dragon in 3D. I learned a lot from these two specifically and I loved them the most. My mentor helped me a lot during the convention by telling me where everything was and when some talks were going to go on. The second talk that I went to discussed the different aspects of the elements of the movie The Last Airbender. I expected pretty high from this one because the elements are very difficult and to make it look realistic takes a lot of work. When I went to it they definitely exceeded my expectations. It was amazing how they could create such realistic water even though it was hard to follow them as they were explaining how they made it. I still learned a lot from what they were saying. I was extremely interested how they showed me all the other elements. As the other benders would move the elements the surrounding area would be affected by the change in size. This made it seem like the bending was real. All in all this was an extremely useful and helpful experience. I saw more character design at the talks than anything else. I found this very helpful in a way that I learned about many aspects of it. My mentor also helped me out and directed me in the path that I needed to go. He showed me opportunities in the convention that would be more useful to me than others. The talks there definitely surpassed my expectations, especially the water in The last Airbender and the characters in How to train your dragon. I was very lucky to come and it was an amazing experience. SIGGRAPH 2010 was the experience of the lifetime; a mass of knowledge awaited anyone interested in learning. I had been anxiously awaiting almost a year for this year’s conference; little did I know I would actually be attending it!!! A few months before SIGGRAPH my mother happened to get in contact with the Pioneers, and before I knew it I was a part of this year’s Pioneer Mentoring Program! SIGGRAPH gave me the opportunity to learn a wealth of knowledge concerning the computer graphics field as a whole. Despite my particular interests in Animation, I found myself being intrigued by the other technologies pertaining to the field of analytics, interactive products, or 3D physical modeling. I’ve been aspiring to find a career in my greatest passion, (being animation,) and this conference opened my eyes to a whole new realm of wonder and excitement. The entire week was an adventure, every corner we took, and in every course or keynote speaker session we attended, awaited the unknown. I had the chance to attend the “editing motion” technical paper talks. There, I was elated to find myself immerged in the techniques and programming required to create effective example-based facial rigging, interactive generation of human animation with deformable motion models, spatial preservation, and much more. During the fundamentals of visual analytics course, I enjoyed a particular presentation that proposed the process of data arrangement in a more anthropological and psychological way. During the duration of the week I dropped in on the animation clinic that led us behind the scenes into the making of “LOOM” and “Poppy”, (two award winning films in this years’ animation festival). They presented and explained a small fraction of the extensive processes required to complete their individual films. In “LOOM”, they particularly focused on the construction, movement, and development of the spider web throughout the film, as the maker of “Poppy” primarily focused on the translation of the acting through motion tracking, as well as concept and character development. There were many other courses, panels and talks I was elated to sit-in on, from Disney studios presentations to the “30 years of animation” panel. Relating to full feature presentations, my two partners and I were welcomed into the world of “the people behind the pixels” for movies such as Avatar, and Iron Man. In the Avatar presentation I learned about the process of creating character deformations relating to muscle structure, as well as spherical harmonics lighting application and applications. Both of this years’ keynote speakers were exceptional. Don Marinelli was awe-inspiring as expected. As a lifetime student on a quest to absorb a well rounded knowledge of the infinite nuances residing in life’s’ knicks and crannies, I felt inspired to fight for my education. He empowered the concept that art and technology are like opposite colors, although they are opposites when you use them together they flatter each other and can create something undeniable wondrous that couldn’t have been originally accomplished. Always looking to the future and working to accomplish the impossible is something he instilled in me, although when you have that certain spark of passion there are no limits, and nothing remains impossible. Jim Morris’s talk focused on film and his inspirations. Relaying on his own story was inspiring, and featured some amazing film work over the past years. Looking back, past technologies were overwhelmingly advanced for their time, and there has been no way but up from there. Emerging technologies was an amazing display in which advancements amazed, and new techniques expanded. Of the bunch, I was most effected by Sony’s interactive multidimensional display that you could see from practically any angle, as it could be compared to a hologram. Another astonishing display was the “No Touch-Touch Screen”, in which a camera could lock onto the dimensions of your finger as you held it inches away from the screen, and effectively allow you to interact with the phone, from typing, to enlarging/reducing images, and even to drawing 3-dimensional images, all without ever touching your finger to the screen. The Studio was within the same vicinity of Emerging Technologies and gave anyone the ability to test out computer graphics technologies. I spent an extensive amount of time experimenting with the artrage3 program. The exhibition hall gave us access to all the greatest film, art, and computer graphics schools, academies and universities, as well as access to the latest computer programs and technologies. Of course they have conference specials, and so I picked up a few program order discounts so I could later purchase some of the programs for myself. My two peers made the experience of the week exceptional as they were just as interested as me, and more than willing to discuss what they learned and their own ideas and perspectives. The collaboration of our different interests gave us different perspectives on how we viewed new materials and technologies. During my arrival to the conference I was mortified I might feel inferior to the mass of well educated SIGGRAPH attendees, but I soon discovered it was a welcoming environment, in which you could spark up an interesting conversation with anyone. The interaction with our mentor gave us wisdom and a wealth of understanding of the conference as well as the people and technologies present there. He introduced me to people in the animation and design field that may present me with the ability and knowledge to learn and grown from. Every day he would point us in the right direction based off of our interests, and help give us opportunities we wouldn’t ordinarily receive. Near the end of the week he gave us the spectacular opportunity to interact with a new project him and thousands of others have been working on over the past years. It was a privilege and honor to meet and interact with my mentor, peers, and their family during the duration of the conference, and I have left with a wealth of knowledge and insight I would’ve never been able to receive anywhere else. I couldn’t thank my mentor enough for supplying me with the experience of a lifetime. I hope to see him again as I progress and eventually join the field of animation and computer graphics. My SIGGRAPH experience was overall, informative, exciting, and extraordinarily fun. Though I did find quite a few things that went over my head, I’m still amazed and grateful that I had the opportunity to be exposed to the world of design this early and thoroughly. One of the places that I visited the most was the Computer Animation Festival Screen Room. I sat in on the Commercials and Cinematic show as well as the Shorts and Long Shorts show. It was amazing and inspiring to see the power and potential of designers in the field today. I was very entertained not to mention more motivated than ever to pursue a career in the field of Graphic Design after watching those clips. Another place that I visited most often was the Exhibition Show Room. If I didn’t know what to do, I’d go here. I found that the room was full of excitement and there was always something to look at or do. I enjoyed sitting in on the Wacom Tablet instructional sessions, getting information and pamphlets about colleges with a Graphic Design Major, and sitting in and watching artists sketch in the 20 minute sketch competitions held by Nvidia (so much so that my friends and I were practically regulars). Here, I learned useful techniques that I would apply to my own art as well as got useful information about design and the field itself (be it from booths or from wandering designers). I found the Emerging Technologies Show Room to be absolutely fascinating. I learned about how the holographs that mimic the person who talks into the microphone work, played with the bicycle wheels, played with the sand bugs, and learned (and saw) the new technology that I’m sure I’ll be seeing in stores within my lifetime. The whole experience in there was by far the most astounding thing I saw at the convention. Just being exposed to all of this new technology really impressed upon me the drastic advancements we’re making. All in all, my SIGGRAPH experience was enjoyable, educational, and enthralling. Being introduced to the world of Graphic Design in a conference like this makes me want to pursue a career in it all the more. SIGGRAPH ended up being an amazing experience for the three days I was there. I went to many courses and talks but one that stood out a lot was the talk about detailed surfaces. In the talk, I learned about the interesting process of capturing high-resolution skin textures from real people and placing them onto different models. This method was used in avatar to create textures for flying creatures out of texture molds taken from the back of someone’s hand. My mentor showed me through the Art Gallery and explained all of the art pieces to me. My favorite art piece was Final Wisdom because of its very creative use of its thermal camera. I also liked how the artist used four-channel audio to make it sound like there were bells ringing around you. After seeing the Art Gallery, we went to Emerging Technologies and saw a lot of really cool gadgets including the awesome Sony cylindrical 3d monitor as well as the television with five colors. I found it interesting how much of a difference there is between 5-color and 3-color TVs especially with certain textures such as water. We also went to a meeting for Animation Maui, an online 3d animation studio with a lot of potential. The Exhibition was just awesome. I played videogames, learned about colleges, software, hardware, animation and more, while gathering swag simultaneously. From my experience at SIGGRAPH this year, I have learned a lot about stereoscopic media, 3d textures and animation and left the conference with more questions than I had come with, wanting to learn more. SIGGRAPH has always been a part of my life. However in the past few years, as I’ve begun to appreciate the math and science behind some of my favorite movies and video games, I’ve been more persistent and open minded when asking about this seemingly unnecessarily long acronym. After realizing that a fair amount of the “stuff” at SIGGRAPH directly relates to the projects I indulge in with my brother, dad, and cousin in our garage (infra red multi touch tables, gatling gun potato cannons, animatronic fire breathing dragons, etc) I was eager to see what SIGGRAPH was all about. First off, I have to say about 80% of the talks, papers, and presentations I heard went right over my head, but the parts I did understand were truly amazing. After the third or fourth day, as I began to familiarize myself with the basic computer graphics lingo, it was exiting while sitting in West Hall B as the frequency of moments rose were I actually understood enough of what they were saying to get the general point. I probably spent the most time in West Hall B. After all, Avatar had been released recently, and the guys from WETA digital had many presentations on a number of different fields. On top of the fact that Avatar was just an awesome movie, WETA was also the graphics company behind The Lord of The Rings trilogy, which hands down are my favorite films, so I think I made it to every singly WETA presentation that week, which I believe was over nine thousand. Besides the Avatar and other movie presentations I saw in West Hall B (Iron Man 2), Don Martinelli was also a great experience. As I am now in high school, experiencing the consequences of an education system thats centuries old, it was really nice hearing from an adult with the same view point, especially an adult with such a background and passion for his cause. But SIGGRAPH was more then just West Hall B, and I’m glad I got to see the other attractions in the time between Avatar presentations. Emerging technologies was really cool, mainly because most of the stuff there was built out of a garage, just like the stuff we build at home (we actually saw a lot of touch tables very similar to the one we made). In addition to E-Tech there was what I believe was called the equipment show. It was a huge room with all of the latest technology and graphics companies showing off their latest products. Everything from motion capture to racing simulators was in this room, including a line for free Pixar teapots that must have been at least a quarter mile long. In addition to all the exhibits and cool new technologies and graphics techniques, the general atmosphere of the place is pretty amazing. I’m standing there surrounded by the people that pretty much make the world go round these days. Almost everything has graphics tied to it, or at least some aspect of a computer based science, and to be sitting in the same room and laughing at the same nerdy jokes as some of the most talented and genius people in the world is truly a great experience. I could go on and on for pages about everything I saw at SIGGRAPH 2010, but I figure the only thing I really need to say is if I would go back again. I definitely would. I first heard of SIGGRAPH from my mom. She was telling me how our neighbor needed some kids for this big convention thing he was a mentor at. I eagerly wanted to sign up when I was told what it was about. I couldn’t wait to go. However, what I didn’t realize was how much fun I was going to have and how much I would lean. SIGGRAPH 2010 was a fantastic and enlightening experience. I enjoyed the entire convention. I saw most of “Inside the Rabbit Hole” which was very cool. The entire presentation was fantastic. The amount of detail they explained was interesting. I learned a good deal about CG films containing live actors. There is so much more to CG than I expected.The amount of pieces and time it takes to make just one scene,the puzzles that arose, and how they got passed them, its just so amazing. When I was told about SIGGRAPH, I could not have possibly imagined what It really was like. I was blown away when I saw it. It was huge, so much to do, and so much to see.SIGGRAPH exceeded all of my expectations. The Exhibition hall was amazing.I was like a kid in a candy store. The technology was very cool and entertaining, Ienjoyed the “Organic Motion” stage and the Wacom Booth and so many others. The Wacom booth was my favorite.I spent thirty minutes on one of their tablet monitors, it was just so much fun! I found it kind of neat how many places and companies had booths I recognized, and just how much I was actually familiar with, made me feel more comfortable. Everything I saw gave me a much better idea of what kind of world I am going to enter once i get out of college.It gave me a better understanding of what I have to work with when i get to that part of my life. My mentor was very helpful. I did not follow him or see him that much, because I felt like exploring on my own. However, when I did have a question he was easily accessible and helpful. Over all a very good mentor andenjoyable to talk to. He also encouraged me to go see certain places which I would’nt have seen otherwise. There was so much at SIGGRAPH it was a great experience. Once again the information I gained will most definitely help me on my career path. It was invaluable having the opportunity to personally test the new technologies. I learned about some new programs I could use to practice my talents and some fantastic technologies to use them on. There was just so much to see and do. I gained so much, not to mention the cool free stuff!I’m definitely not forgetting anything I did there.Over all SIGGRAPH was a wonderful experience and I am so happy and grateful I got the chance to go. I hope I can go to the next one! The 2010 SIGGRAPH Conference in Los Angeles was quite an eye opener. I was very excited by the opportunity because frankly, I knew nothing about computer animation and the idea of being immersed for a week in something entirely new sounded exhilarating. Upon arrival, I met with my mentor and my two peers. SIGGRAPH proved to be as much of a social event as it did an educational one. I spent more time with one peer, who I had just met. Her excitement only increased my elation for the upcoming week.After introductions, the three of us headed straight for the Avatar in Depth talk. It was very technical, and truthfully, way over my head. That did not lessen my enjoyment, however. It was fascinating to peer into the world of computer graphics, even if it was just a small glance. I came out of the talk still not really knowing how Avatar was created, but I did gain a better understanding of the complexities of computer animation. We then went on to explore the Emerging Technologies room. I was amazed and felt like a young child in a science museum. Flashing lights and interactive prototypes were everywhere, a dream come true. I could have easily spent all week in that single room, playing with all the new technologies. After roaming for several hours, we made our way to watch the Technical Papers Fast Forward. I found the fast pace very entertaining and informative. In addition to helping me schedule my week, the Fast Forward also introduced me to the Stanford bunny. I was astounded, and exhausted, by the immense amount of information I had accumulated over the course of just one day. On Monday morning, I decided to attend the Computational Photography technical paper talk. With photography as my main hobby, the talk sounded intriguing. The first two segments, The Frankencamera and Image Deblurring, were fascinating and I’m anxious to use the technology they presented. The third segment about extending the depth of field was slightly out of my grasp and after it concluded, I decided to try to catch the tail end of the All About Avatar talk. My mentor highly recommended that all three of us go see the keynote speaker, Don Marinelli and I’m sure glad he did. Don was incredibly entertaining and inspirational. I am one who deeply appreciates both the sciences and the arts, so it was reassuring to see someone so successful in both fields. I feel now that I won’t have to abandon one subject for the other, that it is possible to be involved in both simultaneously. We then headed for The Making of Avatar production session, which I found to be the most enjoyable and informative Avatar talk. At the end of the day, we attended the Computer Graphics in the Last 30 Years panel. It was simply amazing to see the huge advances made in computer graphics just over the course of three decades; from practically nothing to virtual images indistinguishable from reality. My brain was filled to capacity with an abundance of facts and information, but I was eager to learn more. Bright and early on Tuesday, we attended the Iron Man 2 – Bringing in the “Big Gun” production session; it proved to be very interesting and informational. I never really gave much thought to the abundance of work that it took to create the movie, but this talk helped me realize that so many of the small details are all products of computer graphics. The keynote speaker Jim Morris was also fascinating. It was amazing to hear about the founding and history of Pixar, from a small company to the internationally renowned movie producer it is today. Even after three days, I was still amazed at everything SIGGRAPH had to offer. The Fundamentals of Visual Analytics was the first talk I attended on Wednesday, and it turned out to be one of the most interesting talks. One of the presenters spoke mainly about the psychology of images and it was mind boggling. She showed us a picture of a soccer player about to kick a ball; it appeared that the kick would be nice and strong. But then she showed us the same image, but mirrored. In the mirrored version, it seemed like the kick would be weak. It was the same image, but our brains perceive objects on the left as more powerful than objects on the right. Afterwards, we perused the Emerging Technologies once again. Never did it get boring. We then decided to see The Making of Day and Night. Although not my favorite Pixar short, I thought it was by far the most unique.To see how the little ideas grew into the completed product was both fascinating and entertaining. We then stopped by The Studio and got the chance to use the Wacom Cintiq tablets. It was a real treat to be able to use such an expensive piece of equipment. At the end of the day, we went to the Electronic Theater. Wow! The variety of different animations was astounding. I specifically loved Upgrade, which brought me to tears it was so funny (and true), and Loom, which combined some of the most amazing animation I’ve ever seen with an equally amazing storyline. It was an excellent way to end the day. I explored the areas I had not seen yet on Thursday, including The Sandbox and the Exhibition. I was excited to find several video games at The Sandbox, and played with the flight simulator, which was much more difficult than it appeared. I then attended the talk on subtle gaze direction, where I learned some techniques on how to discreetly make the eye look at a certain area or point. I very much enjoyed the Exhibition. The abundance of professional computer programs and top of the line computers and servers was awesome. I love technology and I loved being able to see so much of it.The Exhibition concluded my time at SIGGRAPH. I had a truly amazing time at SIGGRAPH. I learned much about the world of computer graphics and animation, which appears everywhere in the world today. SIGGRAPH was much more than I expected and an amazing opportunity. I’ve always heard that math is everywhere, but I could never see it. SIGGRAPH opened my eyes and let me glimpse at the math that is all around me. I am very grateful that I was able to partake in this awesome experience. Over my three days at SIGGRAPH I experienced many different things. These included meeting my mentor, going to the expo itself, and visiting some of the many exhibits, like Emerging Technologies, and talks. During the convention I saw many, many things that had to do with animation and graphic design. One of the specific talks I visited was How to Train Your Dragon in 3D. My mentor talked about many interesting opportunities I could take and places I could visit within the convention. What I liked most about SIGGRAPH overall, was all of the opportunities it presented, be it to learn or find a career, it delivered. My expectations for SIGGRAPH were fairly high after reading about it, and I was not let down. SIGGRAPH provided everything I was looking for, and more. The talk I visited was “How to Train Your Dragon in 3D” in which they talked about using different camera types to convey different emotions, for example a handheld, shaking camera for action scenes and an organic, steady camera for romantic or peaceful scenes. They also talked about not overdoing the 3D in movies, as it could lead to undesirable results. The designers talked a lot about character design and showed many stages of character development. The panel talked a lot about lighting and simplifying the background. They used these in conjunction in order to draw your eye to the focus of the movie at that moment in time. They also talked about silhouetting characters to achieve the goal of making the movie more dramatic. The last thing they talked about was getting accurate weather based on the movie’s location and time of day. The Emerging Technologies exhibit was about just that, emerging technologies. All of the contraptions were very cool, and fun to get hands-on with. Although most of some of the inventions did not necessarily have practical uses in their current form, all of them could probably be applied in better ways. An example of the innovations they had were a device that allows you to scroll and type mid-air on a mobile phone. Another interesting invention was a bar of LEDs attached to a bicycle wheel, and programmed to show animated images as the wheel spun. All in all, SIGGRAPH was an amazing and very educational experience even just from the three days that I went there. I learned a great deal of things about animating, videogames, and electronics in general. This was a great experience, which I wish I could repeat. Thank you for allowing me to go on this very informative conention. Have you ever had a memorable experience that you don’t want to forget? Just about all of us had, including me. What was this memorable experience, you ask? It was none other than my experience at SIGGRAPH, the renowned convention for all branches of artists. It was indeed quite a different, enthralling, and memorable experience, which I shall now share with you. Upon arrival at the convention site, I was amazed by the sheer professionalism that I perceived from the building as well as the people within it. The building was very clean, organized, and quite large to my amazement and delight. Everyone was mature and relatively polite in explaining where things were and how they worked. Some of these people included my mentor, as well as a substitute mentor who was there when my regular mentor could not attend on the first day I arrived. I greatly appreciated that both my mentor and my substitute mentor did not restrict me in any way, and allowed me to go off and see any of the features I wished throughout the building on my own. This was another thing I was delighted to find out. After I arrived, it had come to my delighted realization that I had a full access pass. I was flabbergasted by this fact, because it came to my knowledge that these were very expensive and hard to come by. Not only that, but these passes allowed me to go into any of the conference rooms to listen in on presentations, or observe certain exhibits. There were many advanced discourses that I honestly could not understand if I put all my mental capacities at a maximum. They used terms I could not possibly comprehend such as ray-tracing, which I honestly still do not fully know the meaning of. However, I was free to leave whenever I felt like it to move onto other places, which I found to be rather convenient and flexible. Some places I went to within SIGGRAPH were highly amusing, entertaining, and informative. There was the Emerging Technologies Room, which presented all sorts of fascinating ideas for technological advances which amazed me, and made me almost feel proud to witness such inventions. They were all incredible, and certainly a sight you just had to be there in order to know how everything was. Another place that excited me to no end was the Exhibition Room, which had various booths of amazing contents. Many of the various features within that place were so extraordinary, and I felt as though I had delved into a dimension of such proportions that my mind had overflowed with knowledge and entertainment. Certainly, there was no lack of things to do there, and I felt I had learned more about the art industry than I had in my life. The best part of all was the fact I was able to share this experience with my good friends, which made everything ever more enjoyable and satisfactory. In fact, the only complaint I would have overall is that of the ridiculously overpriced items, including food. It is a sad thing when Starbucks becomes the cheapest place to satisfy the stomach. Overall, I do believe this experience was definitely a memorable one. Sure, the food was overpriced beyond belief, but that did not soil my memories of that wonderful place. It was fascinating and enjoyable; truly something I am grateful I was able to attend. I wish to thank any and all who made a part in making this experience of mine possible, for it is certainly something I will not soon forget. The discussions I had, the sights I was able to witness is something to treasure, a pleasurable memory I wish to keep. If I were given the opportunity to do this all over again, I wouldn’t hesitate to accept, as well as encourage others to join in as well. I didn’t know what to expect — all I knew about it was that it had to do with computer graphics, animation, and art. I had no I idea that it was going to be such a huge event! With people all over the world and most of them professionals in computer graphics, animation etc. Most importantly I made some very good friends there. We were paired off with our mentors they were a very cool group of siggraphers. After they helped us on showing us where everything was and making sure we always had something to do, they went off to work in their important conference jobs. SIGGRAPH had a lot to offer, the entire convention center was in use! What interested me most were the Exhibition, Emerging Technologies, The Sand Box, and The Computer Animation Festival. Every morning when I got there and the exhibition was not yet open, I went to the sand box and played with the Wacom tablet. Then in the exhibition I would make line to get these little collectable tea cups I didn’t even know existed. I did learn a lot from this experience, I sat down in rooms were they show you how movies were made like, Avatar, and Tron Legacy which hasn’t even come out in theaters. The video game making was very cool too. But my favorite was the making of “Day & Night” the short Pixar film. It was made very differently to any other 3d animated film. It was like making three separate different films in one, they explained. Emerging technologies was a completely dark room were people showed off there little inventions. Well more like there revolutionary inventions! Before this conference I had never in the entirety of life seen a hologram! And too see what everyone was doing here was amazing. From bicycle wheels that lit up to a bubble piano and a laser security system.I played a lot with Sony’s hologram brick breaker. I also learned how to use the new version of Photoshop. In the same room was the art gallery where people made really cool works of art using technology. After most of our day me and the friends I made went to the computer animation festival. There were really cool films and commercials that I hadn’t seen and to put them in a big screen made them seem very important. Over all this was the best experience of the year for me. And now I have a better focus on what my career should be in the future, who knows maybe it will bring me back to siggraph. As I stepped into the Convention Center to check in to get my full conference pass I really didn’t know what to expect. This year I just finished my second year of high school and I took a class called graphic design using strictly Adobe programs such as Photoshop and Illustrator.The work that some of the people from the making of The Last Air Bender exhibited on their slide show was amazing. As I stepped into the Convention Center to check in to get my full conference pass I really didnt know what to expect. It was my first time attending SIGGRAPH and being inside the Convention Center. The quick presentations really helped me see what I was most interested in. The lectures that i was most interested in were The Last Air Bender, Avatar, and the video game lecture. The Last Air Bender lecture and How to Train A Dragon were probably the hardest for me to understand, but i wasn’t completely lost.It’s amazing how the smallest things in the movie like water and fire could be so technical and take so much time and effort to put together. I really enjoyed the video game lecture about Prince Of Persia and Monday Night Combat.In Monday Night Combat it was pretty interesting how the basic outline of the stadiums looked when they first started working on it and how detailed everything is now. I really cant wait for the game to come out. Prince of Persia really didn’t interest me at all. Out of all the lectures the one that I really liked the most was Avatar.It was weird and awkward to see the actors on set without all of the editing, where in a scene that involves the avatar running through bushes in reality is just someone in a mocap suit no where near a jungle. Walking from lecture to lecture I enjoyed stopping at the video games that you guys were showcasing.Emerging technology was pretty interesting also.The exhibit that i thought was most appealing was seeing the mocap on display in person, it looks pretty fun and something that I would definitely do. Over all I thought that SIGGRAPH was a great experience for me and i really enjoyed my time spent I could really see myself in the future trying to get into the line of work that some of the people I observed do. This being my first year attending Siggraph, I had no idea what to expect. I didn’t know what I would come across there, what types of emerging technologies I would witness, or even what to do once I arrived there.The experience was actually quite overwhelming.There was so much to accomplish in one short week.From the lectures to the exhibits to the show room there was never downtime at Siggraph. I spent most of my time at the lectures.One lecture I attended, the one pertaining to The Last Airbender and How to Train Your Dragon movies were particularly intriguing.Though some of the content went over my head, I still feel as if it was an ideal learning experience.They spoke of the processes needed to create the effects of fire and water for the movies and truthfully I was not following it too well.However, just to know the trials and tribulations one needs to complete some of the smaller things in a major motion picture gives you a new found appreciation for what moviemakers go through.Another lecture I attended was the one in the large auditorium about Avatar.One of the main players in the production of this film (I do not remember his name) spoke of the ins and outs of producing the highest grossing movie ever.He went into detail about some scenes he particularly fancied and some scenes that have certain peculiarities to them, and once again I feel a newfound respect for what he does.Also, just to know what it takes to make the largest grossing film is an eye opener.I knew I was seeing the best of the best.Those are just a couple examples of the lectures I sat in for. Another big thing for me was going to the emerging technologies room.It was always a treat to just browse the room to see what everyone was up to.This was where I found the most interesting stuff like robots and new-age children toys.One thing that particularly sparked my interest was the mo-cap area.I find it quite fascinating that one person’s every motion can be transferred to computer in an animated form.Another small portion of my time was spent playing the video games on display in the hallway.It was a good way to pass the time in between events. In short, I feel as if Siggraph 2010 was a positive experience for me.It opened my eyes to all of the technological opportunities available.I could see myself perhaps trying to pursue a career in some of the fields showcased in the convention. When I first walked into the Los Angeles Convention Center, I was a little bit unimpressed. The opening lobby did not have a bunch of booths and it made the convention seem a lot smaller than it actually was. It wasn’t until the Exhibition hall opened on Tuesday that I could easily see how huge SIGGRAPH really was. One disappointment was that, at least the exhibition hall, used to be bigger and there were more companies showing their products. I would have liked to see more inthe exhibition hall because there was enough booths tat one could easily see them all and look at the products in a day of SIGGRAPH and there wouldn’t be any new things there for the rest of the convention. While at SIGGRAPH I went to the Computer Animation Festival-Production Session for the visual style of “How to Train Your Dragon” and Alice in Wonderland: Down the Rabbit Hole. Though they were interesting, there was only three of that type of presentation and there was only one a day. Also many of the presentations I wanted to go to happened before I could get to SIGGRAPH or were at the same time as other presentations I personally wanted to go to. Many of the presentations also seemed to be extremely technical in the description of the Conference Locater that came the the badge. Since they seemed out of my understanding, I didn’t go to some of the presentations that I could have gone to. Also the Conference Locater did not list where any of the room numbers were and I could not find any other booklet or pamphlet that listed where the room numbers were. The Studio area was really amazing as they had different types of technology that I had never seen or heard of before then. One of the technologies there that I thought was interesting was the wheelchair virtual reality. I thought it was interesting because it gave one a feel of being in a wheelchair and the effort it takes to move the wheels without actually being injured and put into one. Some more the technologies I really liked were the projected bugs that one could interact with the sand base that could also be manipulated by anyone. I also enjoyed the tablet PC area where anyone could use an empty tablet and start drawing or wait for a demonstration and a class on drawing by a professional artist. Before I went to SIGGRAPH, I only knew I wanted a job in computers, not knowing if I wanted the art side, the programming side, or the hardware side of things. Since SIGGRAPH has ended I have been more interested in the artistic side of games and programs. I haven’t really wanted to be an artist before, but I am really interested in becoming an artist, if not for a career then as a hobby. I am also a little interested in the programming side of video games and programs. I have had some experience in programming in Java and I am interested in learning other languages and creating some fun applets. When given one of the best opportunities you can possibly get as a seventeen year old and not have to pay for it you wonder how you will ever be able to take advantage of all the things it has to offer. 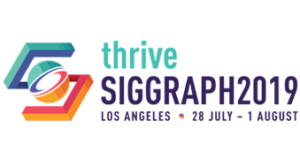 When you see how many different courses, talks, and exhibits there are at Siggraph it’s pretty overwhelming but exciting at the same time. The hardest part is even understanding what things are when you read the schedule, but once you pick a few things and go check them out it’s a little easier to understand and be able to absorb all the information. Siggraph seems like the door to the future with all the technology that is contained inside each room. It also opened a door for me because I never thought about how complicated and interesting everything is behind the scenes in the digital world. It makes you realize how much time and dedication goes into computer graphics, movies, video games, and so much more. On Sunday, we arrived not knowing what to expect or what we were going to do. We registered and received our locaters and began to pick out a few things that sounded interesting. Emerging technologies was filled with exciting discoveries including a led tile drawing pad from Japan which seemed like a lot of work was put into it to be able to write things and tilt the pad around to make the little lights slide around. There was a new musical instrument program where you can make sounds with just about anything and have the sounds or vibrations transferred to a music making software. Another cool thing was Acroban the Humanoid, a little robot for kids that reacts to you when you touch it. It also had some cool dance moves. Even though the talks I went to were a little too advanced it was cool seeing how the fire was created in “How to Train Your Dragon” and how they made the water effects on “The Last Airbender.” They talked about the program Plume, and showed how it’s used to manipulate fire and make crazy effects. The Papers Fast Forward was both helpful and funny. I’m glad I attended it because it gave me a better idea of everything going on at Siggraph and I was able to pick out a few things I liked and could attend. I was amazed at how many different papers there were, how each one of them was so technologically advanced, and how no two were similar in what they were about. There are few movies out right now that can keep my attention. One of them is Avatar and I was happy to find out that there were a few things going on about it. I went to the Avatar in Depth Talk and The Making of Avatar which was my favorite event at the conference. They showed how they filmed most of the movie by merging real life footage with digital footage which was amazing. I thought it was really cool how they would show video clips in three different stages of the process. I would have never realized how much work and dedication was put into it. It made me think about everything else in life and how complex most things are, especially in the digital world. A course I went to was Stylized Rendering in Games. The makers of a new shooting game talked about how the style of it came about and all the work they put into it. I learned from the makers of a few other games that the style and the way you market a game is a big part of the video game process. They showed how some games might not have the best graphics or features but it is styled that way and can be successful if done right. Siggraph 2010 was an awesome experience and without my mentor, or the Pioneers, I would never be able to get the experience that I did. A whole new world was opened for me that I never knew existed. I got to experience first hand, what the future of computer graphics and digital design has to offer. I walked among Professionals and Innovators of the industry and got to see and learn about some of the same things they did. I hope to take advantage of my experience and maybe even pursue a career in the digital field that is shaping the future. The SIGGRAPH Conference was an amazing experience. I have always been surrounded by computers considering the majority of my family works or at least dabbles in those fields. When I found out about this conference, I was extremely interested because I could see the direction animation and graphics were going and what I would be potentially working on in the future. This conference definitely did not let me down; it fulfilled all of my hopes and more. On my way there, I was dreading the endless lines that I’ve always experienced at other conventions. However, registration was much simpler than the others’ allowing me to spend the day at the conference as opposed to waiting in line; I greatly appreciated that fact. Finding my mentor was also painless since we were given each other’s phone numbers and emails to set up meetings and such. The organization of the conference was coherent and logical making the conference run smoothly, at least for my purposes. My mentor was very helpful for the conference. He met up with me as soon as I got there and registered and proceeded to take me into the Exhibit Hall and take me down the row of colleges. He showed me how approachable the admissions officers were at the convention allowing me and my friend to approach more schools later in the day after Brad left. He also marked my conference schedule book on which talks he recommended and he reminded me of changes in the schedule that hadn’t been printed in the book. Brad also helped me with my plans for the future by further explaining what some majors or careers would entail. He was extremely encouraging and supportive. Because the Exhibit Hall was so dimly lit, the monitors and lights from the booths were all the more attention-grabbing and interesting. This hall was my first taste of the convention and it was a great first impression. The energy of the hall was exhilarating and I was able to participate in demonstrations that I didn’t think would be available to my age group including: 3D gaming, using the new Wacom tablet, using Zbrush and 3D printers, and much more. Although the food was relatively expensive, it was better than I expected it to be. The Art Gallery and Emerging Technologies display room was one of my favorite parts of the entire convention. The intersect of innovation, intellect, and sheer creativity in that room was inspiring. I had a lot of fun with the 3D Brickbreaker game by Sony. It was interesting to see people reinvigorating a game that I thought had already passed its prime. The faceless companion was also very interesting especially since I already have so many pets of my own; it definitely behaved like a faithful pet would which I found incredibly clever. The only disappointing part about this room was how small it was; I wanted to see more and I’m sure there are more innovators out there that deserved to be presented in that room. The posters and the talks were also very interesting. Although the majority of them were over my head considering I am only a high school student, I really enjoyed seeing the direction these fields were going in and the impressive minds displayed. My favorite talk, by far (although I didn’t get a chance to see the “keynote” speaker), was the Alice in Wonderland talk. It was so strange to see the movies I watched be dissected like that and to see how barely any of that movie was “real”. It was very interesting to see how they dealt with the problem of Alice’s changing height and the fact that many of the characters, if not all, had completely animated parts. Although I didn’t know too much about those fields, I could tell the speakers knew what they were talking about and how to present it to the crowd. Also, the transitions were painless. All in all, I had an amazing time at the convention. Though, I would’ve appreciated attendance of a few more colleges for browsing and researching considering I will be applying for college in the fall. The conference definitely helped me refine my career options which I greatly appreciated. I am very happy I got to participate in the program and that I got to experience this convention.